If you're a business owner, chances are that your responsibilities fill much of your available time. A great number of tasks can appear to fill your time, and it can seem like there's always something to do. Our team's rapid service with parking lot stops can check at least one item off your list. When it comes to parking stop installation in Waco and Temple, TX, we are the team to choose. Call 254-716-8685 at your first opportunity if you would like to ask questions or learn more about our services. While it is possible to self-install your concrete parking stops, a professional installation is recommended. State and local ordinances guide the placement of these structures and must be followed to avoid fines or other reprimands. Experience is also necessary to ensure no cracking or damage is done when drilling the holes and attaching the stop to the ground. Our skilled experts are up to date with all local and state codes and ordinances to ensure the correct and accurate placement of your concrete stop. Our team’s experience helps us in the field when attaching the stops to ensure no damage is done and your stops stay strong against the elements. We partner with top suppliers to offer you the highest quality materials and discuss your options with you to help you make the best decision for your business. Call us for concrete parking installation in Waco and Temple, TX! When you call the professionals at eSquared Asphalt Maintenance, you get more than a simple, standard installation. We inspect your concrete or asphalt to ensure there are no signs of damage or weakness that could hinder the attachment of your stop. We also measure and layout your stops for your approval before attachment to make sure you get exactly what you want. We provide stop setting alone or in partnership with parking lot sweeping, cleaning and repair services for a completely new look and feel to your parking lot. Keep the outside of your business as neat and clean as the inside with our maintenance and concrete parking stop installation services. When you need parking lot service, our experts can complete the job quickly and professionally, saving you time, effort, and cost. Our parking stop installation service ensures that your stops are accurately and correctly placed for maximized durability and longevity. 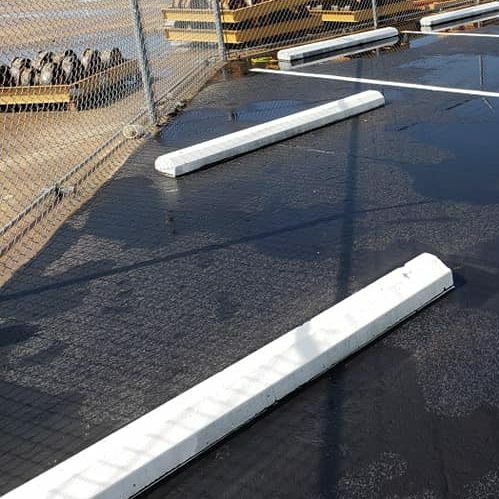 When you need parking lot maintenance or concrete parking stop installation in Waco and Temple, TX, call our experienced experts at 254-716-8685 to get it done right. Updated on March 21, 2019 at 1:41 pm by eSquared Asphalt Maintenance.